Start 2012 on the right pedal stroke by doing the A Bi-Cycling Dandy Excuse For Getting Hibernated In January -- also known as the ABCDEFGHIJ Ride on New Year's Day! Chris and several CCers are planning to join the Medina Bike Club for this annual tradition, and they sure would like to have you bundled up and riding alongside them. 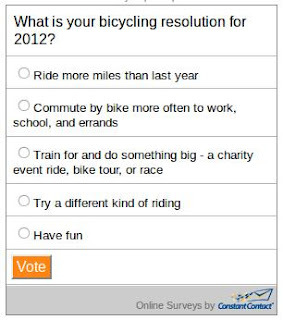 If biking in the January chill doesn't motivate you, tell us what does in this month's online poll: What is your bicycling resolution for 2012? Ride more? Ride to work? Or just have a whole heckuvalotta fun?! Click here to click your vote. It takes just a few seconds -- and makes you feel like you're one step closer to keeping the resolution!